Today Google announced the largest, and most diverse, purchase of renewable energy ever made by a non-utility company. 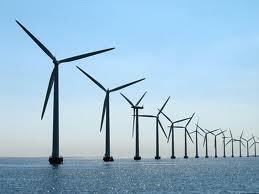 Google has already committed to purchase more renewable energy than any other company. Now, through a series of new wind and solar projects around the world, we’re one step closer to our commitment to triple our purchases of renewable energy by 2025 and our goal of powering 100% of our operations with clean energy. Today’s agreements will add an additional 842 megawatts of renewable energy capacity to power our data centers. Across three countries, we’re nearly doubling the amount of renewable energy we’ve purchased to date. We’re now up to 2 gigawatts—the equivalent to taking nearly 1 million cars off the road. 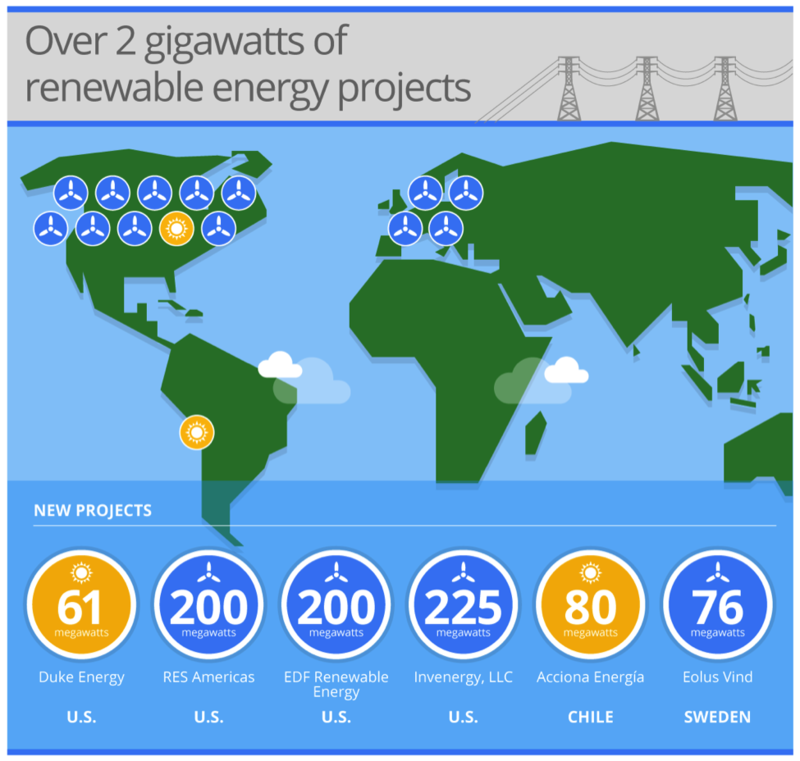 These additional 842 megawatts represent a range of locations and technologies, from a wind farm in Sweden to a solar plant in Chile. These long-term contracts range from 10-20 years and provide projects with the financial certainty and scale necessary to build these wind and solar facilities—thus bringing new renewable energy onto the grid in these regions. For our part, these contracts not only help minimize the environmental impact of our services—they also make good business sense by ensuring good prices. First, we’re building the world’s most efficient computer infrastructure by designing our data centers to use as little energy as possible. Second, we’re driving the renewables industry forward by fully committing to renewable sources. In 2010, we entered our first large-scale renewable power purchase agreement with a wind farm in Iowa, and we subsequently completed a number of similar large-scale energy purchases over the past five years. Today’s announcement is another milestone in this area. Third, we’ve worked with our utility partners to help promote transformation in the utility sector. In 2013 we created a new program that enables customers like Google to buy large amounts of renewable energy directly from their utilities. Today’s announcement includes the first solar project enrolled under that program. And this past summer we announced that our newest data center will be on located on the site of a retiring coal plant and will be 100% renewable powered from day one. Fourth, beyond our efforts to power our own operations with renewables, we’ve made separate agreements to fund $2.5 billion into 22 large-scale renewable energy projects over the last five years, from Germany to Kansas to Kenya. These investments have been in some of the largest and most transformative renewable energy projects in the world with a goal to help drive renewable energy development not only as a customer but as an investor, and bring down costs for everyone. And we’re also working on new technologies and ideas—ranging from Project Sunroof to Makani Power to air quality monitoring—that we hope can make a cleaner energy future an option for many more people. With world leaders coming together at the COP21 UN conference on climate change in Paris this week, there’s no better time to focus on renewable energy. We hope that our efforts play a small part in boosting all of us in the race to solve climate change. Hey Buddy!, I found this information for you: "Google announced the largest purchase of renewable energy ever made by a non-utility company". Here is the website link: https://www.duurzaam-ondernemen.nl/google-announced-the-largest-purchase-of-renewable-energy-ever-made-by-a-non-utility-company/. Thank you.